Jewish students at Northwestern University participate in a program sponsored by the Tannenbaum Chabad House. Two festive dinner parties with students, alumni and Jewish leaders ushered in celebrations marking a quarter-century of operations at Northwestern University’s Tannenbaum Chabad House. First up was a Feb. 13 evening soirée in the university’s prestigious James Allen Center – home of the Kellogg School of Management – where 140 individuals gathered to pay tribute to the alumni and community philanthropists whose joint contributions in honor of the historic anniversary came to $130,000. Among those supporters was alumna Jessica Raymond, a 2007 Northwestern graduate and student at the Benjamin N. Cardozo School of Law in New York, who holds a deep appreciation for the tireless work of the center’s director, Chabad-Lubavitch Rabbi Dov Hillel Klein. Rabbi Daniel Moscowitz, regional director of Lubavitch-Chabad of Illinois, delivered the gala’s opening remarks, followed by greetings from both Northwestern Dean of Students Burgwell Howard and Evanston, Ill., Mayor Elizabeth Tisdahl. Menu highlights of the event included a smorgasbord of kosher Asian-themed cuisine, a bread bar and desert table, full-service pasta station, and a gourmet cappuccino machine. A video presentation showcased a montage of stand-out moments from the past 25 years at the Chabad House, and Asterik, the school’s all-male a cappella group, performed, as did Chuck Field, a well-known comedian and ventriloquist from the Chicago area. 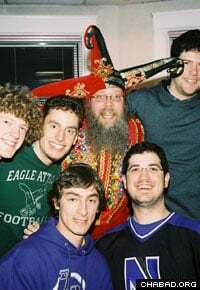 Rabbi Dov Hillel Klein, center, celebrates the holiday of Purim with Northwestern students. The journey of the past 25 years has had its challenges for the Chabad House, which was founded on a campus where Jewish life was not always so welcome. “When we came here, the university was somewhat hostile to Jewish life,” explained Klein, who arrived in the summer of 1985. “There was no kosher meal plan and it was commonplace to give mandatory classes on the High Holidays. All of our competitors – Cornell, Stanford, Harvard – offered a kosher meal plan 10 to 15 years before we did. In conversations, Klein refers to “closet Jews,” those Northwestern student who, prior to the Chabad House’s strong presence, were embarrassed to embrace Judaism in any sort of public matter lest they be ostracized by various elements on campus. But today, Jewish life is not only tolerated at Northwestern, but also welcomed and encouraged. The school sports a kosher meal plan, as well as an AEPi chapter, and on any given Friday night, you can find upwards of 125 students at the Chabad House dinner. Of the approximately 8,800 undergraduates, a full 13.6 percent identify themselves as Jewish; even Morton Schapiro, the university’s third Jewish president, keeps kosher. “Now the university embraces Jewish life to the nth degree,” said Klein. “They are supporting us in a variety of different ways. We work together with school faculty and staff to put together programming. We have helped change and transform the very ethos of the Northwestern University campus. Zinn, who participated in a summer 2008 Taglit-Birthright Israel trip led by Klein and run by Mayanot, considers it one of her favorite Chabad memories. In addition to its Sabbath dinners and Israel trips, the Chabad House runs a host of social and educational events, including hospital visitations, alternate Spring Break trips to South America, weekly Torah classes, and sessions of the popular Sinai Scholars Society. Klein’s future plan for Chabad is to expand even more so that it will be able to affectively reach every Jewish student on campus. Malina Saval is the author of "The Secret Lives of Boys: Inside the Raw, Emotional World of Male Teens" (Basic Books). Her articles and essays have appeared in the Los Angeles Times, LA Weekly, Glamour, Flaunt, Heeb, Forward, the Jerusalem Post, Premiere.com and Variety.